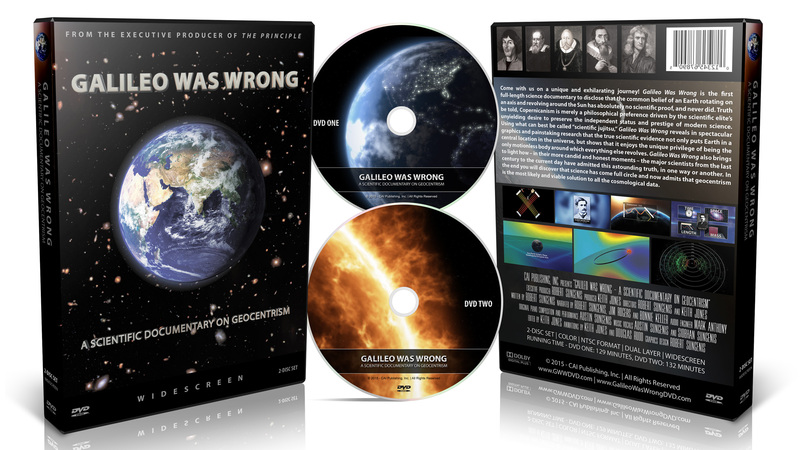 "Galileo Was Wrong, A Scientific Documentary On Geocentrism produced by CAI Publishing INC., is a science documentary that is different from the usual science that we are supposed to believe in. It is an astonishingly good science documentary film for many different reasons. This film is so good and has such a high positive educational value that it ought to be shown in every advanced high school physics class, as well as physics for liberal arts, introductory college physics, and astronomy or cosmology classes. Every college in America should provide this film to its students for its amazing educational value. This film also should be shown on PBS and the BBC as an educational film, since it is far superior to the NOVA and Discovery science documentary films that appear on those networks. This is the best educational film that I have ever seen that covers the topics of modern physics and cosmology. It is the latest most up to date documentary that discusses the current, and as we discover in the film, the most important science discoveries of our lifetime." Harry Hamlin Ricker III is a retired electrical engineer who writes commentaries on physical science, science history, impact of science on society and the philosophy of science. He has a B.S. in Electrical Engineering from Virginia Tech and a Masters Degree in Electrical Engineering from the University of New Hampshire. He has worked for Illinois Institute Of Technology Research Institute, Johns Hopkins Applied Physics Laboratory, and Communications Satellite Corporation. He has been an amateur astronomer for nearly 50 years and was leader of the Natural Philosophy Alliance relativity interest group for five years. He lives in Newport News, VA.